When the people of the Dominican Republic want to unwind or celebrate, the dance of choice is Merengue! 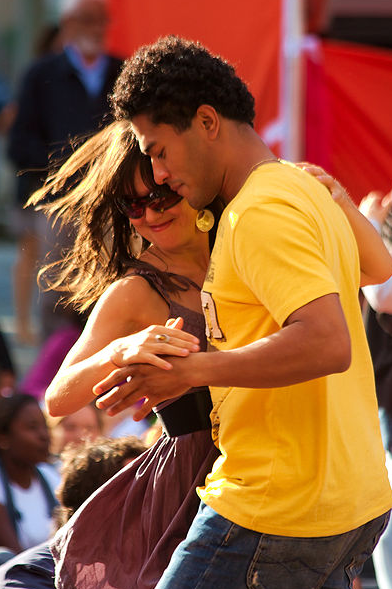 Merengue is the Dominican Republic’s official dance form. Because of Haiti’s proximity to the country since they share the same island, Merengue has also reached its shores and the Haitians have created their own version of the dance. In Haiti, the dance is called Meringué. The Haitian Meringué or Mereng is said to have evolved from African slave music, especially chica and calenda and injected with the French influence of the Minuet ballroom dance sometime in the 18th and 19th centuries. It is believed that the black slaves witnessed how the French performed the Minuet in the colonial homes and from there created their own version of what they saw when they had their own celebrations. Unlike the rather staid and boring European dance, the slaves decided to incorporate their own steps and made the dance more upbeat by dancing it to the thump of drums and creating a faster rhythm for the dance. This transformed the French minuet into something more joyful, which is often characteristic of African dances. The exact origins of Merengue are unknown since there are many theories that abound. Regardless of the true origins of the dance, what is certain is that the people of the Dominican Republic, and later other Latin American countries, have fully embraced it with open arms and swinging hips. By some accounts, including the words of folklorist Frederique Lizardo, founder of Ballet Folklórico de Centro de la Cultura de Santiago, the music of Merengue came from Upa Habanera, a type of Cuban music, which arrived in the middle of the 19th century to the Dominican Republic via Puerto Rico. There was a part in this music that was called Merengue. The music and the dance were not that popular around 1844 but somehow managed to gain a foothold by 1850, replacing the Tumba. One of the most common beliefs as to the origins of Merengue is that it was a dance popularized by slaves brought in from Africa. It was said that the slaves who were chained or tied together would work the fields and cut sugar to the beat of the drums. Since the slaves were tied together, each person’s leg was dragged. This dragging movement created the slight hip motion seen in the dance. At the same time, the original dance is more conservative since the couple held each other’s hands at some distance, unlike today’s version, which is much closer. In another version of the stories surrounding the origins of Merengue, folks contend that a wounded hero returned to his village after fighting a war his country was involved in. Although they were victorious, the local hero came home with his lower leg amputated and replaced with a wooden stump. He was given a joyous welcome, with much merriment. To sympathize with the wounded hero, the other villagers also danced by limping and dragging one foot to the beat of the music. While this version is quite far-fetched, as some believed he was a local man with a limp with who used to dance in the beach all the time, it is less believable than tracing the roots of the Merengue to African slaves. It’s believed that the name Merengue evolved from the whipped egg white and sugar dessert called meringue, associated with the cuisine of the French and the Swiss. It’s possible that the dance was named such because the movements mimicked the frenetic movement of an eggbeater when making the dessert. Dance enthusiasts believe that one of the reasons that the Merengue dance became so widespread in the Dominican Republic is because the steps are so easy and the dance is easy to follow. Other Latin dances have complicated arm movements and complicated footwork. For example, the Tumba comprises eleven different dance positions. At the same time, it very easy to create the music for Merengue since the musical instruments used are quite easy to find, such as the Dominican bandurrias, Tres and Cuatro. In the 20th century, the guitar is the lead instrument used to create the Merengue rhythm. This means that the music could be created quite easily and so people could start dancing the Merengue just about anywhere. To dance the Merengue, a man and woman simply have to face each other and hold each other’s hand in what is called a closed position. The man holds the woman’s waist with his right hand, while his left hand holds the woman’s right hand. In the original version, the hip movement is created when the shift in weight is transferred to the left foot, which moves sideways to the left for a small step and then the right foot is dragged to the close position. Today the hip movement is created by the couple slightly bending their knees as they move sideways to the left, repeating the pattern of opening with the left foot, followed with the right. Throughout the dance, the hips of both the man and woman move in the same direction. Each person steps to the said movement called “paseo de la empalizada” or “stick-fence step.” The couple follows the same movement moving to the left as they glide and cover the dance floor. Partners could execute clockwise or counterclockwise turns. In the Merengue de Salón or Ballroom Merengue version, dance partners maintain their vals hold on each other without separating. In the Merengue de Figura or Figure Merengue, the turns are executed individually, but the partners are still required not to allow their hands to separate. The movement of the body is concentrated from the ribcage downwards, keeping the shoulders square and the upper torso erect. While Merengue is a fast dance, the turns are done slowly, with the dancers taking as many steps as they wish. In the 20th century, many musicians tried to get merengue introduced in various ballrooms. However, high society was initially scandalized by the dance because of the rather suggestive lyrics and its association with African music, and its stigma of being slave music. Some of the people that initially pushed for Merengue were Julio Alberto Hernandez, Juan Espinola and Juan F. Garcia. Francisco Antonio Lora Cabrera, better known as Nico Lora, is regarded as a father of merengue. He was a folk musician in the Dominican Republic. Rafael L. Trujillo, former president of the Dominican Republic is the man credited with finally succeeding in gaining the widespread acceptance of Merengue and making it the official dance of the Dominican Republic in 1930. In downplaying the lyrics of the music genre, more people found the music and dance form more acceptable. It was during the dictatorial reign of Trujillo that the song “Compadre Pedro Juan” by Luis Alberti reached international fame. In the Dominican Republic, the biggest Merengue celebration is the Merengue Festival, which is held for two weeks beginning in the last week of July each year. For more than thirty years, the residents in the capital city of Santo Domingo flock to the streets and dance away to the top Merengue bands in the country. There are free concerts during the Merengue Festival and it’s certainly one of the most enjoyable and highly anticipated dance celebrations in the country. It’s true that you can’t keep a good thing down and this adage applies to Merengue as well. The upbeat tempo simply proved too irresistible and so the dance and music genre quickly spread to other South American countries and all throughout the Caribbean. Today, Merengue has become synonymous with Latin American dancing, translating the inner passions and emotions felt by the dancers into synchronized movements. Just like the fashion and passion expressed and communicated by dances, the art of language translation involves proper form, thought, extensive practice and inherent skills.